Ever wondered how wildlife photographers capture fast running cheetahs in their photographs so clearly? It all comes down to mastering the art of high speed photography. 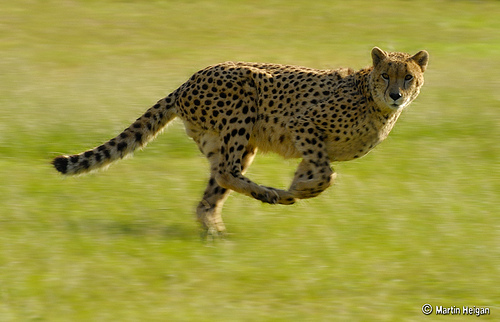 The fastest animal on Earth running. High speed photography requires a lot of skill and practice but the results are outstanding. High speed photography is a technique that enables you to capture objects in motion that would otherwise be too fast to capture using a basic camera or see though the naked eye. With high speed photography you can achieve outstanding results, but it will take a good understanding of it and lots of practice to master it fully. There are two methods of achieving high speed photography. The first involves capturing high speed subjects in a way that makes them look like they have frozen in motion. This involves using a camera with good sensitivity and a high quality shuttering system or a very fast strobe light. The second method involves taking a number of photographs using a high sampling frequency or frame rate. The first practical use of high speed photography was an investigation into whether horses’ feet were actually all off the ground at once during a gallop. This investigation which used high speed photography as evidence was carried out by Eadweard Muybridge all the way back in 1878. Today many photographers experiment with high speed photography by taking photographs of fast moving bullets. The Austrian physicist Peter Salcher took the first photograph of a flying bullet in 1886. Ernst Mach then later used the technique in his studies of supersonic motion. It’s not just people, cars and animals that can be captured using high speed photography; splashes of liquid make the perfect high speed photography subject. When it comes to practicing high speed photography, you need to remember that your camera’s shutter speed is closely linked with its exposure. The faster the shutter speed, the shorter the time available for exposure. Seeing as high speed photography will involve capturing very fast moving objects, you will need to make sure the shutter speed is high and the exposure time is short, so that the fast moving subject of your photo doesn’t blur. The right shutter speed will depend on how fast moving the subject of your photo is. For example a car moving at an average speed towards the camera would require a shutter speed of around 1/1000, but if it were being driven at a much higher speed the shutter speed would need to be increased accordingly. If you are experimenting with high speed photography for the first time, you may find it useful to use your cameras flash. The short burst of bright light will help you to capture the subject of your photo and stop it clearly in its tracks, even if your shutter speed is slightly too low. You will need to ensure the source of light (or flash), your camera’s shutter and the object in motion are completely synchronised in order to achieve a quality photograph. Our final tip is to get to know your subject well. The more you know about your subject and how it moves, the easier it will be for you to take quality high speed photographs. Of course, some things are more predictable than others. For example, you cannot really predict what a cheetah is going to do in the wild. However if you learn about how they move and try to understand their behaviour, you will stand a better chance at having your camera in the right position at the right time and with the right settings to capture stunning high speed photographs.